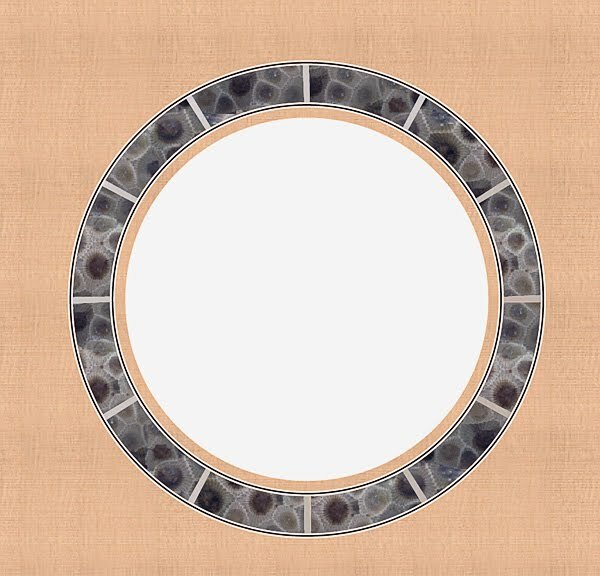 So I've been pondering how to design the sound hole since the start of this project. I wanted something that was unique but also that does not negatively affect the sound quality. I have three ideas, one of which I will share here. Because this is the direction I will most likely go. I had the idea of using Petoskey stone sound-board inlays right from the start of this build. I decided to look this up on the net to see if anyone had done this sort of thing before. I came up with nothing – so I'm thinking, Great! But wait, is there a reason no one had tried this? 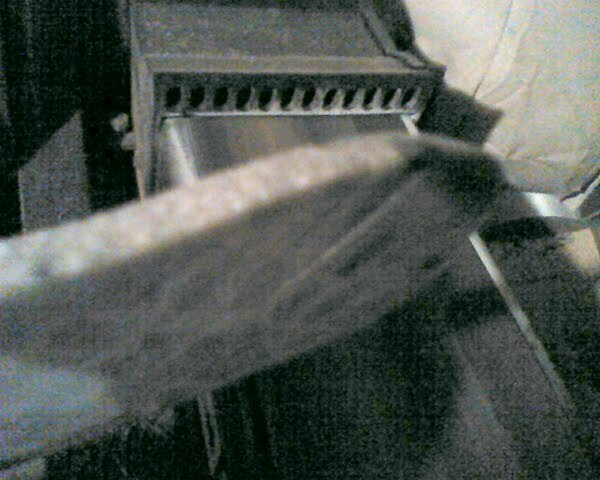 with this dampen the sound?, will this be too heavy?, will the material break when it gets too thin?... Lots of questions. About mid-way through the neck build I met a local luthier here in Traverse City that does inlay of Petoskey stones in his guitars, in fact his logo is a Michigan shaped stone with a star on TC. So yes, people have used stones for guitar making but not yet have I seen one on the soundboard. I don't think this Luthier liked the idea that I had thought of using PS on my guitar, but this is a much different application than what he's using. 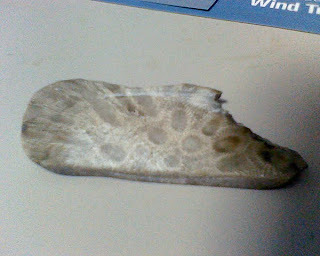 Plus if he can put a patent on using petoskey stones, I'm putting a patent on walnut and maple. Graphic representation only... this is not done. 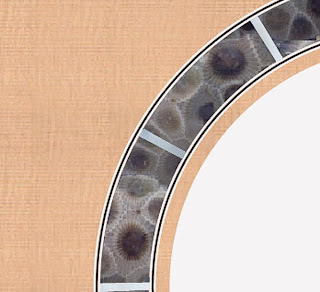 Petosky stone, with mother of pearl bars and white and black binding. Graphic representation only... Close up of above. I did start cutting the stones out on my tile saw... worked great. But I do need the thickness much less. Sanding it down... I will most likely go back to the tile saw to remove more material. 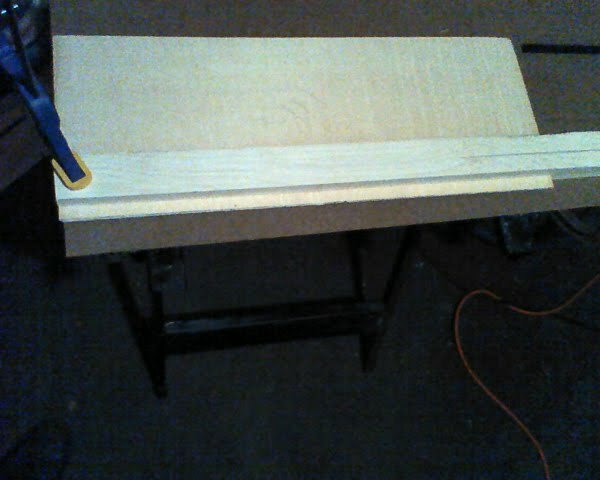 On to the soundboard: Here I was assembling a make-shift shooting board for planing the edges to join the two halfs of the soundboard. There was a worm hole that I had to plane off – so i removed a lot of material then tried to get the edges straight and even... easier said than done. Once you think you have it straight, you hold both boards together up to a bright light to see if there are any high or low spots (called candling). 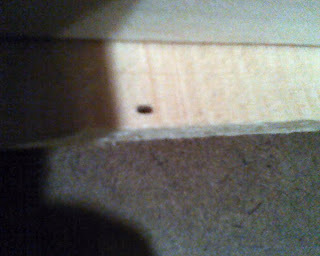 I was chasing high spots all over the place. I adjusted my plane to cut just a super tiny amount and I started to see better results. I finally got it but this was a chore. Gluing up the board – kitchen table style. 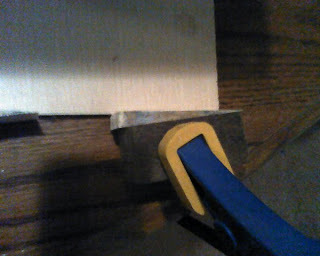 I made some shims to tap into place to apply some pressure to the boards. 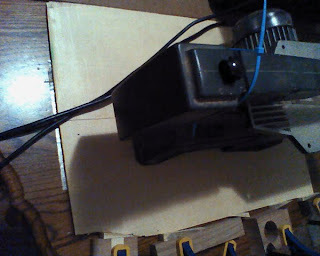 The other side was held in place by a peice of masonite, then I added a weight in the middle... in this case it was a scroll saw. I put a trash bag under the glue line.